Crisis communications situations can come at any time. For individuals in higher education, these crises can vary from everything ranging to violence on campus, professors’ conflict of interest and students’ misbehavior. Just in the last couple of weeks, university communicators at the University California Santa Barbara and Seattle Pacific University have been forced to communicate tragedies to their respective communities following inexplicable violence. In episode 12 of FIR on Higher Education, I discuss this topic with Michael Schoenfeld, VP of Communications at Duke University. In addition to this show, I wanted to provide some resources for how to handle those unexpected crises. Many schools post their crisis communication plans for the benefit of their respective communities. Here are the plans of a few schools. Inside Higher Ed’s analysis of how Virginia Tech handled the school shooting back in 2007 from a communications point of view is quite informative. The Chronicle of Higher Education’s piece “For A Campus in Crisis, The President’s Voice is Key” is also useful reading. Rachel Slocum, assistant professor of geography at the University of Wisconsin-La Crosse, sent an assignment email to students. In the process, she took a few shots against Republicans. She was shocked when this assignment email went viral and became national news. Read more. University professors who didn’t disclose conflicts of interest in public statements came under scrutiny in a New York Times piece. 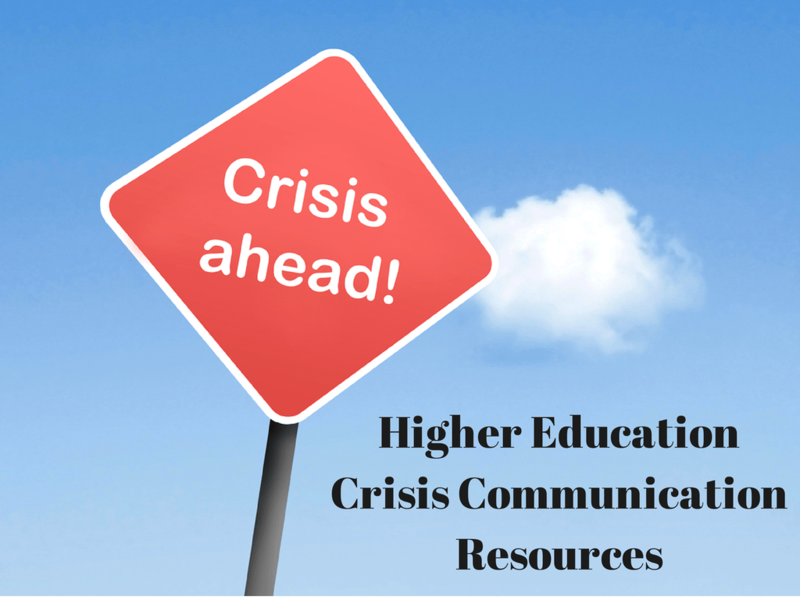 While not specifically focused on higher education, the below links are useful for anyone thinking through a crisis communications strategy. The Crisis Navigator web site extensively addresses crisis communications. Jonathan L. Bernstein’s piece The Ten Steps of Crisis Communications is particularly a useful read. Digitial communications strategist Andrea Vascellari, host of the For Immediate Release on Strategy podcast, recently put together two excellent episodes on crisis communications management. Here is Part 1 and Part 2. It is a couple of years old now, but Shel Holtz and John Havens book Tactical Transparency influenced the way I look at crisis communications situations. The Edelman Trust Barometer also provides research findings on how to maintain trust. Do you know of other interesting resources on crisis communications for? Feel free to add your links to the comments section.